Australia’s largest mineral-sands producer, Iluka Resources, is seeing a turnaround in prices for its products. As with other mineral prices, they have fallen more-or-less steadily in the past few years. In response, in February 2016, the company suspended for 18-24 months its large mining operation northwest of Ceduna in South Australia (known as Jacinth-Ambrosia). But offsetting this, in late June, the chairman (Greg Martin) committed the company to two major projects, at Balranald in New South Wales and Cataby, south of Perth. A feasibility study is underway for the $125-million Balranald project, with an investment decision on it expected by early 2017. A decision on Cataby is linked to a decision on a kiln at the company’s separation plant near Geraldton in Western Australia. Other companies planning mineral-sands operations in different parts of Australia include Cristal Mining (New South Wales), Astron Resources (Victoria), Diatreme Resources, Sheffield Resources, Image Resources and Tronox (Western Australia) and High Titanium Resources & Technology (Queensland). Mineral sands are found on or near beaches – but not necessarily today’s beaches. For example, millions of years ago, Australia’s eastern coastline extended beyond Broken Hill. Rocks near this ancient coastline were eroded and minerals in the rocks were washed down to the sea, ending up on or near the beach. The sea subsequently receded and the coastline moved eastwards, leaving the minerals where they were. They are called mineral sands. They comprise titanium-dioxide minerals, such as rutile and ilmenite (used mainly as a pigment in paint and other products), and zircon (which is important for ceramics, among other things). In Australia, they were first mined in the 1930s at Byron Bay in New South Wales, followed in the 1940s by mining in Queensland. 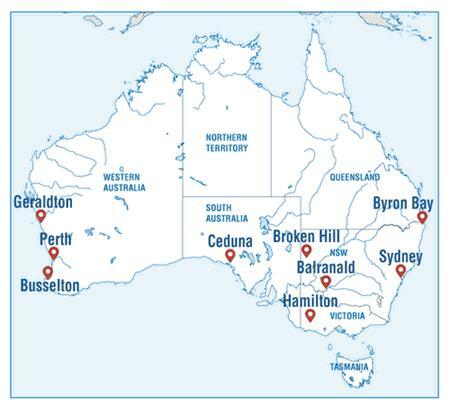 Today, exploration and mining take place mainly (although not exclusively) in an arc between Broken Hill and Hamilton; northwest of Ceduna in South Australia and Western Australia; and between Geraldton and Busselton in Western Australia. Australia is the world’s largest or nearly-largest world producer of mineral sands (its ranking depending on the product).